The soccer team knew they were in for a rough day yesterday, the opposing team was one of the richest and most powerful and well-funded in the area. They are used to this, they used to go on the field in flip-flops and T-shirts, slowly, we are bringing them up to speed. They have new uniforms coming next week with their new name, the Albany Warriors, they have new sneakers and T-shirts and head bands, and there are now 22 people on the team. There must have been 60 players on the opposing team, and parents and supporters of the home team were lined up all across the field. Ali is in the process of purchasing a larger van we helped him buy so that they can get to all of their games and some other retreats, tutoring appointments, and other outings as well. They lost yesterday, 4-0. It was a practice game, the team is undefeated in regular play. 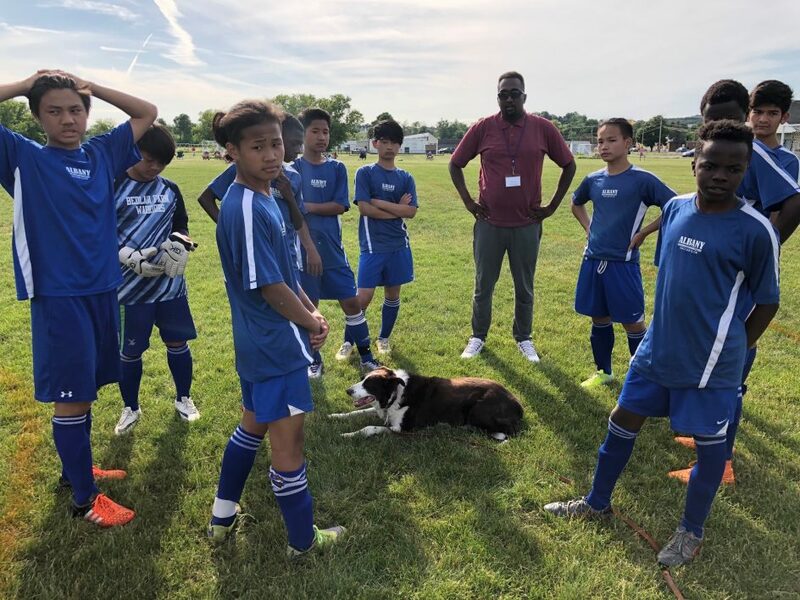 The soccer team has been critical to the lives of these young people, many of whom have suffered greatly in their lives. Most are on the honor roll in their schools, Ali insist they do well with their homework. The team has given them community, a sense of purpose and great pride. We would like to take a dozen of the team’s hardest working (and those with the best grades) to the Great Escape Adventure and Water Park at Lake George in July.This will be a reward for the players who have worked the hardest to learn English, learn the best sportsmanship, do well in school and support their teammates. The trip will cost between $500 and $600 dollars and I would welcome some help in making this happen. If you wish to support this trip, please send your contribution to me at the Gus Fund, Jon Katz, P.O. Box 205, Cambridge, N.Y., 12816, or via Paypal, jon@bedlamfarm.com. The package would be for a one-day ticket including lunch and some photos. Thanks for your help, these kids deserve it. Being a young refugee in America right now is not an easy or simple task. They face hostility and challenges every day of their lives. This is something that would excite them and lift them up, as it did last year when we organized a similar trip. And thanks.